This is a modern condo in a building with 20 units. This unit is on the ground floor and is directly on the beach. No stairs, no elevators, no going around a pool, no going through a gate, but DIRECTLY on the ocean. You can stand up from the sofa and take 15 steps and be in the sand. Take another 25 steps and you are in the ocean. This is a very rare opportunity to stay in a beach condo that is really on the beach. Lounging in a beach chair with music playing not from your headset, but actually from the Bose speakers in the unit. Order beach service from the waiters at the neighboring Coco Maya Restaurant/Club. Perhaps the kids are napping? You are still lounging in the sun because you are still within hearing distance of the bedrooms. Want a cold drink? You don't have to pack a cooler to take with you, just step to your refrigerator for a cold one. Whether it is for private bathroom facilities or the convenience of not having to pack a beach bag, staying this close to the ocean is a luxury not afforded by any other units in Playa. But what about the other great things Playa del Carmen offers? The location of this condo is ideal. You are just 2 blocks off the famous Avenida Quinta and you are at the center of the action. 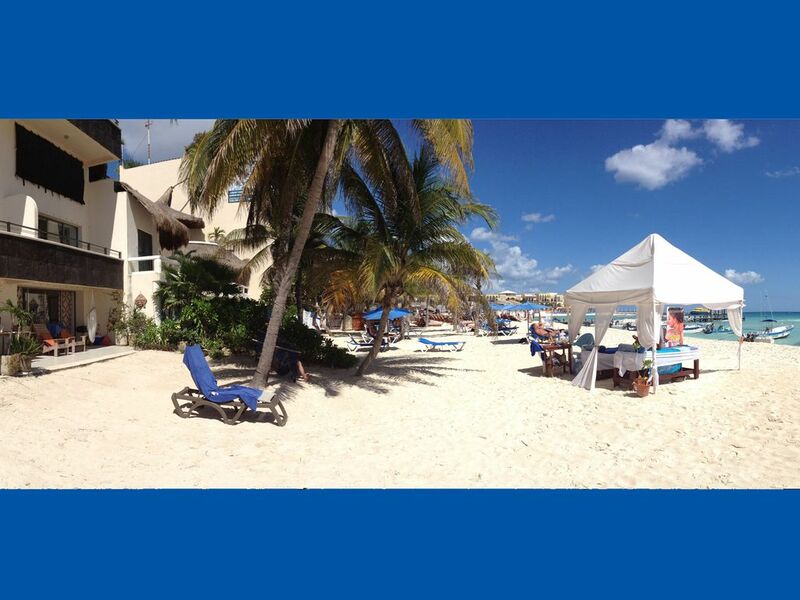 The hottest beach nightlife in town is 2 doors away at the Blue Parrot. Starbucks coffee is just a few minutes walk (We prefer breakfast at '100% Natural' on Avenida Quinta... fresh fruit milkshakes, yogurt and granola, or a full hot breakfast is always available). This unit is owned by a seasoned professional in the vacation rental business, so you can rest assured (literally) that your comforts and conveniences are provided for. The beds have pillow top mattresses with thick mattress pads, 600 thread count Egyptian cotton sheets, and light down comforters. Bath amenities are of top spa-quality, and the kitchen is equipped for even a top chef. Note - if this unit is not available, there are other units in this building that are available for rent. Contact us and we will help you with them. EASTER WEEK, BPM FESTIVAL (first 10 days of January), and NEW YEAR's are particularly festive in Playa and specifically in the district around this condo. If you are not coming for the party during these times, it might be best to look for other dates or for some place farther out of the center of town. Vacation Rentals are my business, literally. I manage over 65 luxury log homes in the Smoky Mountains of North Carolina (see Watershed Cabins in Bryson City NC). The condo in Playa is my personal vacation home, but I rent it out when I'm not there. So, I did things here that most would not expect for 'just a rental': The linens and bedding are really comfortable, the decor is a touch above rental calibre, and some features (like Bose speakers and an well equipped kitchen, for instance) go way above and beyond basic rental comfort. I had visited Playa several times before buying a condo there and fell in love with the ease of the destination and the way that this destination is a 'best all around' place. I have been fortunate enough to travel many places in the world, and Playa is the one place that has all the things I look for in a vacation destination: ease of travel there, great food, great shopping, white-sand beaches, nightlife, & diversity of people. So when on one of my trips, I happened to stumble on a condo model that was directly on the beach, I immediately knew it was something I wanted. You really can't speak enough of the fact that this condo is directly on the beach. You feel so integrated with the beach and ocean while there. Even staying in a beachfront resort, you sometimes feel like you have to 'pack' or 'get ready' to head out to the beach; but with this condo, I go in and out my door, listen to my music, make my own drinks, etc and I do it all from the beach (even surf the internet, as the WIFI goes a good bit outside the unit). I love to set my laptop up with my iTunes and connect to the stereo. Then I turn on the outside speakers and can play DJ right from the hammock using an app call 'Remote' -- it's awesome. This condo is very unique in that it opens directly to the beach on the ground floor. The patio is literally directly on the sand! The ocean in front of this unit is very swimmable. Waves are mild and the depth is generally shallow going out very far from shore. each room is controlled separately, and the wall units feature a 'wave' mode that cycles the fan up and down providing very soothing white-noise for sleeping. 600 threadcount Egyptian Cotton linens, Ralph Lauren towels. note that there is no oven, but a large toaster-oven is provided and actually has a rotisserie for a whole chicken. right on the sand! Waiters from Coco Maya next door will serve you food/drinks right on the patio! We loved the space and layout of the condo. Owners are great and follow up very well with good info. If you are looking for easy access to the party zone of Playa, this is a good spot. The condo is pretty insulated from the 3 AM bass but you can still hear it if you are a light sleeper. This area of the beach has been hit hard by erosion. Fishing boats also use this area so there are a lot of ropes and ties in the water outside of the condo. A short walk up the beach however is more favorable for swimming. I've stayed here a few times in the past. Love the proximity to the beach and the nightlife of Playa Del Carmen. We had a few issues during our stay - water pipe leak, locked door. Both were quickly fixed without any delay. Fabulous view and stylish condo! First, it was a total pleasure coordinating the stay with the condo owner, Tim. He was the upmost professional and very through (and friendly!). We all loved the condo and the location was spectacular. The fans and humidifiers were great in helping to cut down on the noise from the local clubs. Highly recommend! This is my second time staying at Ocean Plaza room 3. It's a great location with amazing amenities. If you are here to enjoy the nightlife - clubs and restaurants, you're in the perfect location. It does get a little loud at night, but perfect for us as we came to celebrate. Was our first time to Playa and appreciated the close proximity to all the shops and restaurants. The condo was very comfortable and just as nice as advertised. We loved our stay at Ocean Plaza. The view and the convenience to everything you couldn't have asked for better. We had 7 stay for a girls get away and everyone enjoyed it there was enough room for everyone. The condo had everything we needed. The mirror in the hallway was exceptional, it made everyone appear smaller. All the girls wanted this mirror for their home. Lol The club next store, our waiter Ulysses was awesome. Served us dinner and breakfast on our patio. The only downside of the club was the big party that went until 6am with techno music which was very loud but that was only 1 night of our stay. Everyone in Playa were very nice and taught us alot about Playa and how to speak some spanish. We visited Phantam Dive for snorkeling. Great people well worth the time and money. First time I ever got to handle a star fish. Our guides were great with our first timers that were older women. The local food during our stay was great. We had a nice birthday dinner and Alux in the cenotes. Overall everyone said they would all come back for another stay.